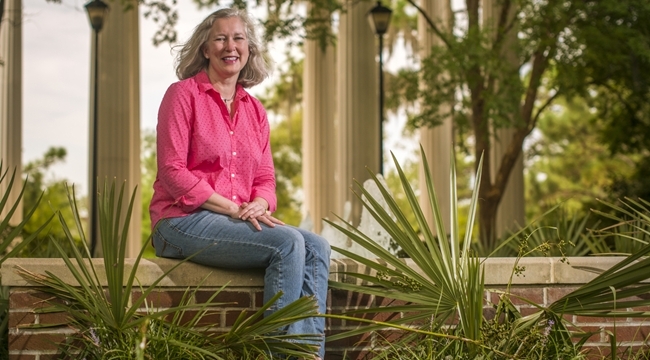 As a master gardener, Wilmington native Elizabeth Dunn sees much more than pretty scenery when she tours the UNCW campus. The same qualities that go into maintaining the university’s lush blend of cultivated grounds and natural spaces – dedication, creativity, diversity and vision – also drive its growth in education, research and community outreach, according to Dunn. “The university has always been so important to our community,” she said. As the wife and daughter of medical doctors, Dunn appreciates the “synergy” that exists between UNCW and New Hanover Regional Medical Center. Both institutions worked with city and county leaders to bring services, programs and people to the area. Dunn is a member of the Board of Visitors and the Friends of UNCW, volunteer organizations that support the university and its mission. The Board of Visitors funds an endowed scholarship and members serve as regional advocates for UNCW. The Friends fund an endowed scholarship and a grants program and take part in special campus events, such as decorating Kenan House for the holidays. Dunn served as chair of the Friends of UNCW grants committee, a position that introduced her to faculty and staff across campus. The committee annually receives applications from UNCW faculty and staff for small grants to support their programs. For the 2014-15 academic year, the Friends evaluated 32 proposals, awarding more than $11,800 to 15 campus applicants. In a way, the grants are seeds of opportunity. Over the years, faculty and staff across campus have used the funds for equipment, artwork, supplies, travel stipends and much more. Although Dunn isn’t an alumna – she graduated from Wake Forest University – she thinks of herself as an honorary Seahawk because of her family’s connections to the university. She and her father both took classes at the university while they were still in high school, and now her daughter Sallie Dunn is a senior music education major at UNCW. “After volunteering here for a number of years, I knew that she would love UNCW and she has,” Dunn said. Her daughter, an accomplished flutist, participated in flute festivals on campus while in high school. The university offers a number of programs – such as music performance groups, MarineQuest and other camps – that bring K-12 students to campus. The faculty’s commitment to giving back to the community has inspired her daughter, Dunn added. When Dunn’s daughter graduates and begins teaching, she’ll represent one more Seahawk planted in the community, ready to help future generations grow.